With Facebook COO Sheryl Sandberg telling women to “lean in,” American female presidential candidates advertising their “granny cred,” and Nobel Peace Prize winner Malala Yousafzai advocating for compulsory elementary education worldwide, the image of women as global leaders is complex and diverse in nature. Leadership can be an abstract concept with few clear definitions. Attempting to outline what defines a woman as an effective global leader can be a daunting challenge. In Women as Global Leaders, editors Faith Wambura Ngunjiri and Susan R. Madsen bring together a diverse group of female scholars to examine the characteristics, motivations, support systems, and influence of female global leaders. The book takes an academic look at the field of leadership studies and emphasizes female global leaders as an integral area of study to understand the contemporary world. The authors question the absence of clearly defined roles and support for female leaders and offer analyses to expand and progress the field of leadership studies. While the resource is an academic text that requires a thoughtful reading, the authors provide a thorough introduction to the concepts and themes central to leadership studies. Readers are quickly oriented to the important questions in the field and offered accessible examples of women global leaders, connecting the dots between current scholarship, the lived experience of women leaders, and the stereotypes and prejudices inherent in global business, government, and education. Ngunjiri and Madsen organize the book into four sections that address different aspects of global leadership. The first section examines the state of women as global leaders and provides a solid introduction to the complexities and challenges of understanding women global leaders. The authors differentiate the skills and qualities necessary for global vs. international leaders and argue for the necessity of increased numbers of global women leaders. In the second section, the authors focus on more theoretical approaches to gender and leadership study. 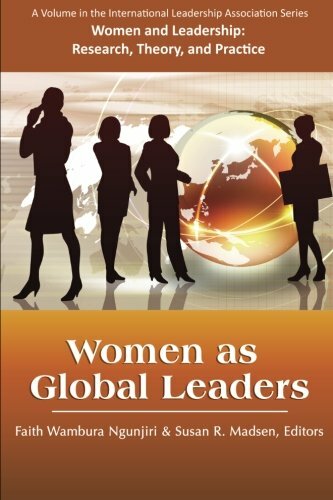 Additionally, the authors discuss alternative leadership practices, emotional and social intelligence, and cultural competency as avenues to analyze the effectiveness of women global leaders. One particularly interesting passage in this section discusses the traits needed for successful cross-cultural understanding and leadership. The discussion challenges readers to examine their own abilities to interact with, support, and understand those from other cultures. In the third section, the authors examine strategies for women’s global leadership development, outlining the structure of a master’s degree program in global leadership and analyzing the efficacy of leadership programs within companies. The fourth section presents four case studies of global women leaders: Malala Yousafzai, Golda Meir, Margaret Thatcher, and presentations of women leaders on film. Three chapters in the book stood out as especially provocative studies. Leadership scholar Karin Klenke proposes an innovative understanding of women’s leadership—as a map that combines geographical, political, personal, and societal events and issues to illuminate the path women leaders follow (whether consciously or subconsciously) to reach their leadership positions. Her “leadership cartography” offers a methodology that takes into account the national and international context, personal motivations, and societal pressures that work together to create a woman global leader. In another article, Paige Haber-Curran and Kaitlin Hartley describe the experiences of four women students taking a study abroad course in a “Semester at Sea” program to illuminate the internal process of change that can occur when confronting unfamiliar cultures. The authors follow the development of these students as they seek to understand their roles as leaders and global citizens. The article provides an inspiring study of transformation and challenging one’s unconscious beliefs. Similarly, in another article, Carol Burbank challenges readers’ assumptions about Muslim women, patriarchy, and agency in her case study of Pakistani child activist Malala Yousafzai. While celebrating her incredible accomplishments, Burbank complicates Yousafzai’s global image by exploring the ways in which Western media simplifies her image as an activist, glossing over her identity as a Muslim Pakistani. Global leadership studies is still an emerging field, but Women As Global Leaders outlines the gaps in current research and points us in a clear direction for future study and consideration. While not overtly religious, this resource is a challenge to CBE readers to take equality to the next level and to consider what true leadership can look like, regardless of gender, on the international stage. All women and men of faith are called to utilize their talents and gifts to forward God’s kingdom in every context and environment, and Women As Global Leaders pushes readers to examine their own stereotypes, prejudices, and fears about gender inequality and to answer Jesus’ call to accept and respect those around us. Kate Netzler Burch is a PhD candidate in religious studies at Indiana University and loves to chat about evangelicalism, social justice, ultimate frisbee, and dogs.